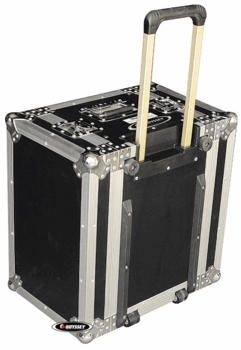 Odyssey FZER6HW Rolling Effects Rack Flight Zone DJParts - All Variety of Parts that DJ Needs. Get your gear to the gig the safe and easy way! Our Rolling Racks feature low profile, super strong wheels and a pull-out handle for superior conveience. This sturdy ATA case accomodates all standard 19" rackmount equipment and features front and back rails. Holds up to 6U of gear.